Preparing dinner for guests or putting together breakfast before work and you forget to set the flame low, the next thing you know the food gets burnt and everyone is choking on smoke or the odour from burnt-on food. We’ve all been there and had to deal with the stubborn stains and dirty mess afterwards. Here are some tips to get rid of the burnt-on food. If you have a light layer of burnt-on food, sprinkle it with baking soda, get a good quality scrubber and scrub away the burnt-on food easily. Fill the pan with warm water and dish soap. Let it sit for a few hours or overnight, then use the rough side of a scrubber to clean the burnt-on food. You can also pour Coca-cola in the pan and let it sit for some time, then use a scraper to clean out the burnt-on food. Fill the pan with water and add a few lemon slices, then bring the mixture to boil. Allow it to boil for some time, then remove the pan from heat and let it cool. The burnt-on food should have softened and easily come off with a scraper, then wash as usual. Fill the pan with about 3 inches of water and add 1/4 cup of baking soda. Bring to boil, and then allow it to simmer for 15 minutes. Turn off the heat and let it cool for a half hour before you wash the pan with gentle scrubbing. 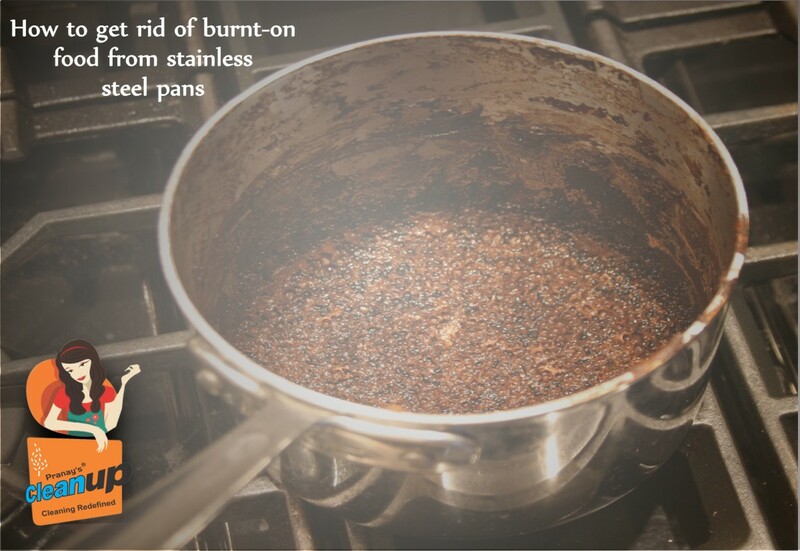 If the burnt-on food doesn’t come off easily, then repeat the process and add 1/4 cup of vinegar. If you have another pan and can do without this one for a few days, don’t bother scrubbing. Simply put the pan outside in direct sunlight for a few days, the burnt-on food will crust up such that when you turn the pan upside down, it should easily fall out. Bonus tip to get rid of the smell of burnt-on food: Break out the air freshener, open the windows and light scented candles or incense sticks. Alert: Do not try these with non-stick pans.